An email marketing strategy is a set of procedures that a marketer identifies and follows to achieve desired marketing goals from email advertising. This plan of actions gives the businesses a direct channel of communication with prospects and customers for brand promotion. Given that for every $1 spent on email marketing, a business earns at least $40, more and more marketers are increasingly implementing this marketing approach. Nonetheless, it is important to note that weak marketing strategies are bound to fail and thus do not deliver the return on investment (ROI). A well-planned strategy with elaborate goals and easy-to-follow roadmap is a must for a successful email marketing strategy. Online business owners use SendPulse to effectively work through all stages of making successful email marketing strategies. A strategy is vital for several reasons. The most important and significant of them are as follows. Having an email marketing strategy in place allows marketers to lay out their email advertising process ahead of time. In turn, other business stakeholders can know what they need to do at each given time, thus ensuring synchronicity while implementing an email campaign. Non-promotional emails are less timely and sales-driven. They are more for establishing relationships and giving value to customers. Contrary to promotional emails that tend to boost sales, non-promotional emails enable marketers to determine the interests of their subscribers, thus helping in mailing list segmentation. In turn, they can follow up with more personalized messages that aid in nurturing and strengthening relationships with prospects and customers respectively. Email marketing strategies spell out all the goals businesses intend to achieve. It is essential for a business to have marketing objectives beforehand to give it a sense of direction when implementing an email campaign. Other than that, email marketing strategies enable marketers to evaluate the effectiveness of their email marketing campaigns. We will now look at the essential steps that marketers should follow to create excellent marketing strategies. Marketers thus need to create emails that are in line with any of these or other desired goals. Finding the right tools is the first step to setting up an email marketing strategy. A marketer will need an Email Service Provider (ESP) with an automation tool among other useful features. SendPulse allows to create, organize, and send emails in a breeze. With Automation 360, marketers can follow up on their customers and send the right emails at the right time. For instance, you can set up welcome emails for onboarding new customers, abandoned cart emails to get customers to take action about the items they have left in the cart, and so forth. Register right now to launch your email marketing strategy with SendPulse. Next, the marketer needs to build their email subscriber list. To do this, one has to identify the target audience that their company serves. Case in point, if a specific business deals with baby clothes, then its target audience primarily comprises mothers-to-be. Thus, it makes sense to use conventional means to get the email addresses of this demographic. An excellent way of building mailing lists is through subscriptions. In SendPulse, you can add subscription forms to your site and thus collect quality subscribers who are ready to hear from the brand. Marketers can embed subscription forms on high-traffic sections such as the footer of the website, sidebar, or at the end of a blog post. 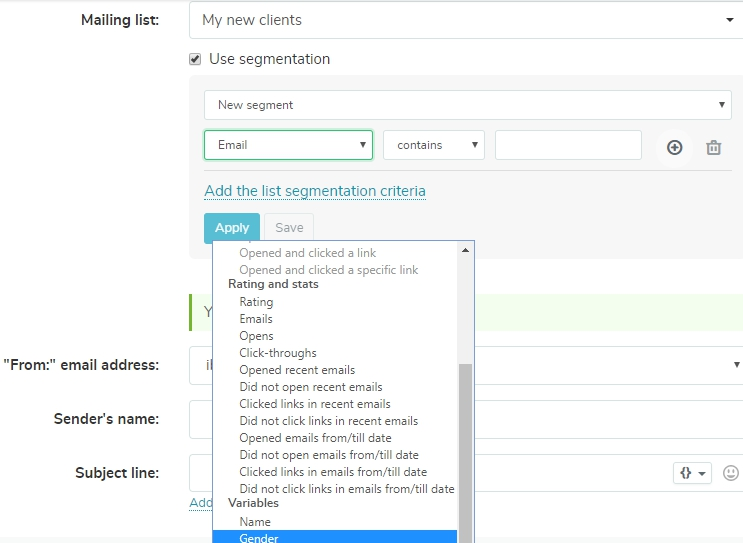 Segmenting is an effective tactic that allows to send highly targeted email campaigns. 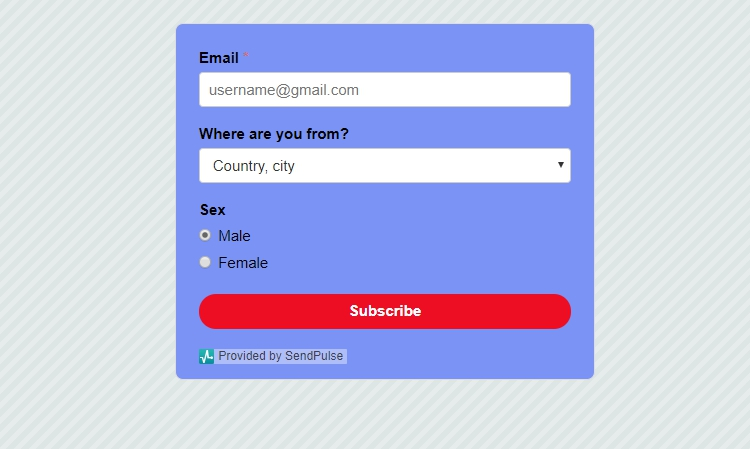 In SendPulse, marketers can segment their mailing lists based on location, gender, occupation, age, behavior, etc. In turn, they can be sure of delivering appropriate and customized messages that appeal to their customers. There’s a great variety of different emails that marketers send. The choice depends on a particular email campaign aim. For example, if a user has just joined your mailing list, send them a welcome email. It a great chance to explain the benefits of working with you. Or, if clients had added some items to their shopping cart and didn’t buy, send them an abandoned cart email to increase sales. Discover more about email campaign types. To ensure that subscribers read promotional emails, marketers should find out the best time for sending. It is, therefore, necessary to experiment in order to determine the time when subscribers are most engaged. A/B testing here proves useful. For email marketing to be a success, messages in the promotional emails should be presented well. Marketers should choose formats, fonts, and text sizes depending on the type of emails that they are creating. In SendPulse, marketers can use a drag-and-drop editor to create beautiful email templates that are customized to match their brand. Limiting emails to a width of 600px. Testing on multiple mobile devices. Using a large font size (ideally 13-14 pixels). With A/B testing, marketers can determine what copy works best by swapping out different aspects of their email such as subject lines (the most popular option), images, CTAs, headlines, offers, and so forth. Adjusting the strategy based on the reports and feedback a marketer has gathered is the last step of developing an email marketing strategy. 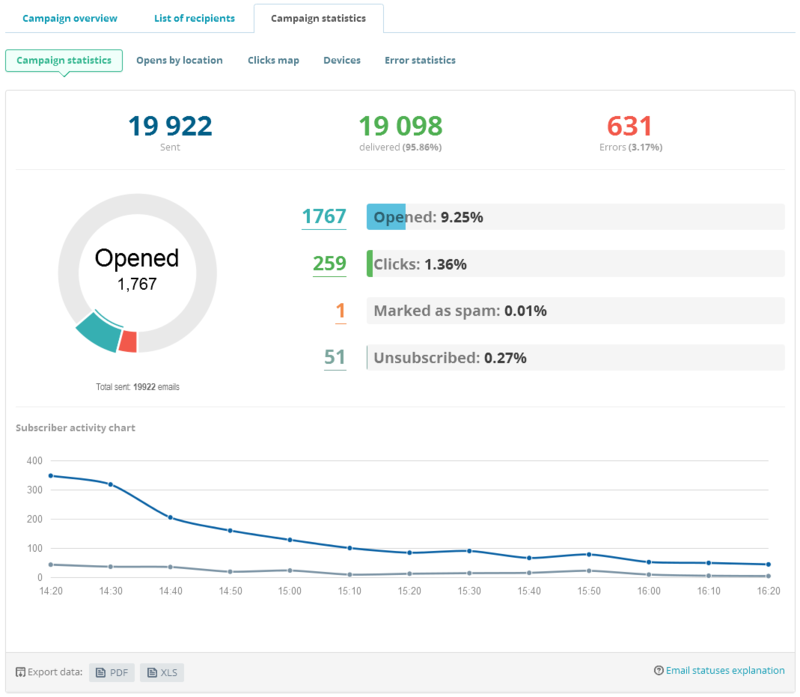 SendPulse provides users with a set of analytics that aids in gauging the effectiveness of email campaigns. Track email open rate, unsubscribes, click-through rates, email deliveries, email bounces, spam complaints, and more. Provide incentives via email that encourage customers to review the products they’ve purchased. Run A/B testing to optimize click-through and open rates. Offer rewards to loyal customers. Be ready for holidays and product seasonality with a newsletter calendar. Sign up to develop an email marketing strategy with SendPulse! Also searched with "Email marketing strategy"
Rate this article about "Email marketing strategy"
If you are interested in "Email marketing strategy" you might be interested in our bulk email service.